These pieces were the result of a design research project (under the supervision of Scott Mayson) undertaken for the honours component of the Bachelor of Industrial Design (Honours) at RMIT University, Melbourne, Australia. 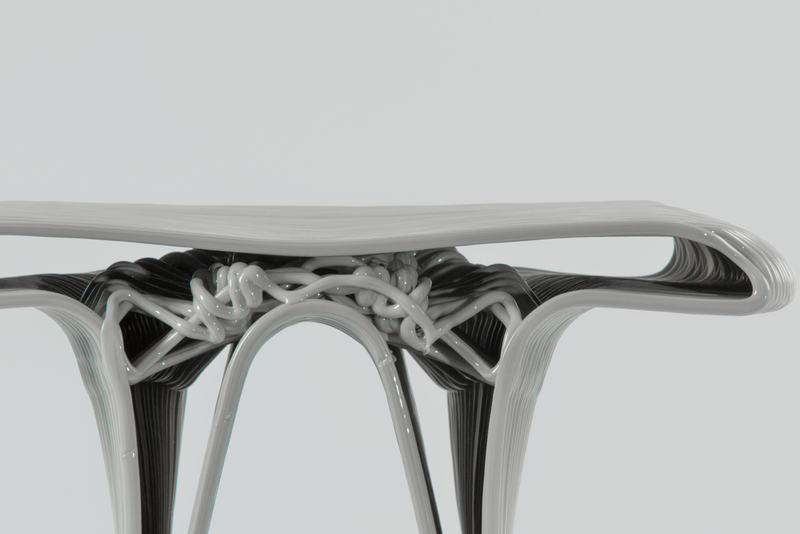 This research project explored the algorithmic design process within the Industrial Design field, through the lens of furniture design and a focus on additive manufacturing and robotic fabrication. The robotic 3D printer is a system that combines a Kuka KR150 robotic arm with a plastic granule extruder capable of Xkg/h and a wide variety of plastics, in it's current setup the extruder uses PLA. It is currently capable of producing parts up to 3m x 2m x 1.5m. It was setup by Ryan Pennings as part of his research project and is housed in the RMIT Design Hub, Melbourne, Australia as part of the RMIT School of Architecture and Design. It is a collaboration between Ryan Pennings, RMIT School of Architecture and Design, and industry.